Today, October 31st marks almost 3 and a half years since I've seen the full theatrical version of Grindhouse. Ever since opening weekend, the film hasn't been available for home viewing unless seen separately or through a video on demand service. But after the release of the Grindhouse Double Feature Blu Ray earlier this month, I can finally delve back into the world how Tarantino and Rodriguez originally intended. The second half of Death Proof, now cleaned up and without the scratches/burns which plagued the rest of the film (in a good way of course) looks about as gorgeous as you can get in HD. The colors are all extremely vibrant, with Tarantino's tremendous eye truly showing through in spades. I woke up and started my day by putting on a classic: My Bloody Valentine. 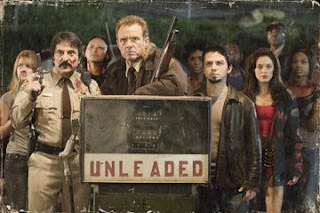 No, not the over the top remake with the overused 3D gimmick, the Canadian original which oozes with atmosphere. It's truly one of the best slashers that exists and with good reason: It's feels fresh and new while still adhering to all of the genre staples. Sure, some character make poor decisions, and their reactions result in the death of either another or themselves, but it's done in a way which doesn't distract from the realism set forth. And when I say realism, I don't mean Saving Private Ryan D-Day scene. This is filled with goofy blood effects, and some cheesy moments but it all works to benefit the film. I find myself connecting with the characters even given their limited screen time. I'm not sure whether it's because the actors play well together or if I'm just blinded by nostalgia but one thing is for sure: It makes for some entertaining screen time. In continuing my tradition of watching favorite horror films of mine, I decided to next throw in Stanley Kubrick's classic film The Shining. In what I would consider to be one of my all time favorite films, Kubrick puts a world on display that I can't help but be mesmerized by. The lush landscapes and eyepopping visuals always leave me craving more. His perfection is more than apparent with nary a poor performance. Nicholson takes a turn which is one for the ages, his subtleties to be studied for the rest of filmdom. Unsettling moments truly find a way to connect with the audience without feeling cheap and unnecessary. The most fascinating aspect is that the scariest moments shown are those when Nicholson is truly going mad and snapping. It's the human side which makes it terrifying, not the supernatural elements. This is one of the many reasons why I prefer the movie over the book, which I find delves a little too into the supernatural and doesn't focus as well on the characters. Kubrick, being the master that he is, strikes a balance between the two, creating an extremely atmospheric and well fleshed horror tale, which is be considered as one of the best ever. Next up brought brought about a film which I consider to be the best horror film of the decade: The Descent. From both a filmmaking and entertainment standpoint the film delivers on so many levels, which allows it to be enjoyed even upon many repeated viewings. Even after seeing the film well over a dozen times I still find something new with each viewing. Whether it's the subtle nods to Sarah's ever growing madness or the blink and you'll miss it appearances by the "Crawlers" early in the film, it brings with it a fresh and entertaining take on a tired genre. The title of The Descent is really what I appreciate and consider to be one of the most appropriate titles for a film ever, mainly because of it's mainly translations. It can be seen as the obvious descent into the endless cave full of monster's where sure death awaits. Then it can be viewed as the descent into madness which the lead character Sarah takes throughout the duration of the film. This more resembles my own approach with the title as I feel that is more of what the film is about. The other part of the film is more of a subplot. Another aspect of the film which I really enjoy is the lighting. Neil Marshall shows exactly the right amount on screen. The rest of the world is shrouded in darkness and it adds to the scary factor in many ways. While the film does suffer from a few "jump scares", this doesn't deter from the greatness that is presented in the 100 minute runtime. They are usually done tastefully and don't come across as cheap, which tends to be a factor which plagues so many current horror films. All of the females give performances which really breath life into the characters and make them more than just cannon fodder. You really feel for them and think that these women could be friends in real life. This chemistry make the third act of the film even more powerful and each death hits a chord. This is a highly praised attribute of the film as it does what so many other films fail to do in developing many dimensional characters in a limited run time. As has been tradition for me since the Sixth Grade, I ended my night with a beloved, and appropriately themed film: Halloween. John Carpenter's masterpiece has become a staple of Halloween ever since I held my first Halloween Party back in middle school. I try to only revisit the classic on Halloween but I usually can't resist the temptation and end up watching it several times throughout the year. No matter what though, I always make sure to pop it in on the last of the October. While it's all been said before about Carpenter's classic, I feel the need to reiterate it's greatness. The cinematography is unparalleled when compared to almost any other horror film. This level of care and dedication just wasn't often seen in a genre considered to be cheap and lazy. 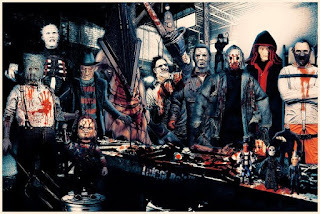 But Halloween changed that in so many ways bringing forth a great unique style and oozing with atmosphere. The use of light can be felt influencing previously mentioned films even. The legend known as Michael Myers may have gotten a tad out of hand in the years that followed 1978, but the original still kept with it an insane, unadulterated form of evil, unyet spoiled by sequeltitis and too much background. 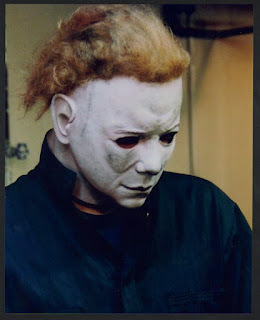 This Michael Myers was terrifying and brought forth an unstoppable killing machine who sticks to the shadows, still occasionally teasing his prey. As this night draws to a close, I look back on it not regretting a single part. I may have spent it indoors watching a bunch of horror films when I could have been out socializing, but I found myself still enjoying it immensely. Those days are often preferred compared to the craziness of the rest of my weekend. So even though I may not be out asking strangers for candy while dressed up in a ghoulish costume, I still made my Halloween self-memorable and will probably continue by trend of watching more horror films. So as this month draws to a close, I say thank you October for getting me in the mood for the season and raising my interest in horror films back to what it once was. I regained that spark which I thought was long lost and has truly proven to me that nothing is truly lost forever, it sometimes just takes a little time for it to pop back up.